On the storied battlefields of Uedama, bot-aspirant carebear jay lacey was decisively beaten by our Agents. The butcher's bill included a shuttle and an empty pod. Still punch-drunk from the engagement, jay lacey asked Agent Sherri for six million isk. jay was confused. To the victor go the spoils--the victor! 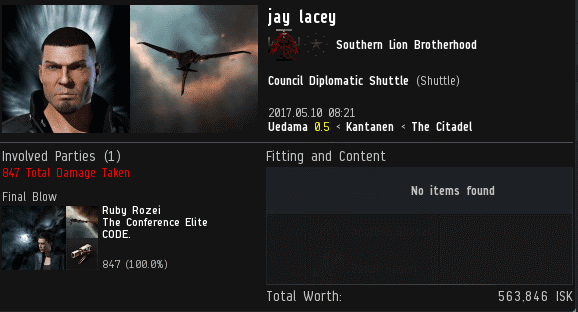 It appeared Sherri had picked the wrong shuttle to pop: jay lacey had powerful friends in nullsec. His connections in Pandemic Legion would redeploy the alliance to highsec, where they would focus on targeting Sherri's Catalysts. jay was just about to refer the matter to PL and leave the convo when an innocent remark from Sherri stopped him dead in his tracks. jay couldn't resist. He would not leave the convo until this whole "PvP" thing was resolved. Although Sherri was obviously a better player than jay, they were both still players. Hence, PvP. jay had a very different view. The miner grew increasingly upset. Our Agent didn't take the bait, though. Sherri wasn't interested in watching jay fly off the handle and rant about his lost shuttle. So she invoked the name of the Saviour of Highsec. This would decide the matter. In a matter of moments, jay would reveal once and for all whether he was a Goofus or Gallant. jay reacted negatively to the mention of my name. This was a major red flag, but Sherri said my name again, just in case. The miner's rage intensified. 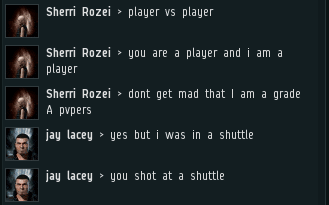 He became so angry that he couldn't help but let something slip: He told Sherri to stop ganking "barges and shuttle[s]". But Sherri hadn't ganked jay's mining barge. Why was jay so concerned about mining barges, unless he was a miner? He was caught. The litmus test had done its work. 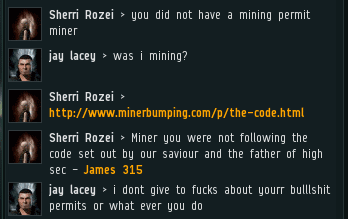 The miner couldn't hide his contempt for highsec's Saviour. Thus, jay's true colors were plain for all to see. Of course, one must be careful in using my name; hearing it more than a time or two can make some carebears lose control. Sherri had spoken my name four times. Now jay was becoming incoherent. 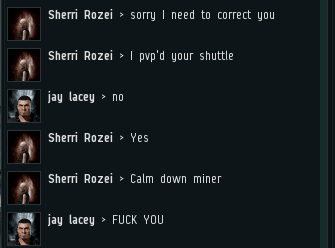 Agent Sherri faced the ultimate challenge: Calm the miner and collect 10 million isk. Wow – so much rage from the miner, over a simple shuttlecraft. Laugh-out-loud funny, this one; Goofus trumped! Right off the bat the agent refers to him as a Jew. You must already be a member of the HSM: High Salt Militia. 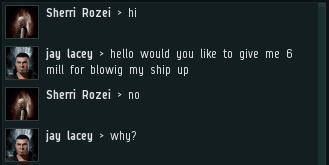 We are dedicated to making High Sec a boring place, and failing at that on a daily basis. If you are not a member you should join, we sit at gates and watch gankers fly past us and win. At no point does the Agent refer to this squalid individual as a Jew. Jews have made countless contributions to civilisation. Jay's sole contribution has been his tears. In fact the only person comparing the miners to the jews is that mad hsm gal that stays up all night "trolling". Herself. What is the definition of a miner by the code? 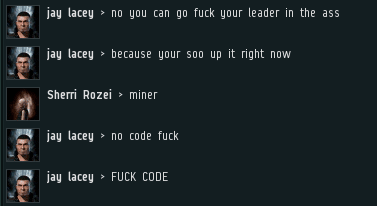 A 'miner' would include anyone in highsec that is not actively enforcing the Code, this would include any PVE or 'hauling' activity. Anyone who allows themselves to be ganked in highsec. 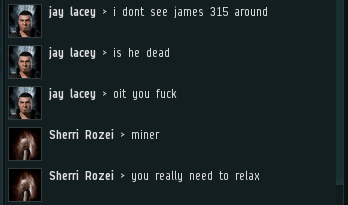 No matter what activity you are engaged in if a ganker can get a clean warp in and kill you before CONCORD arrives, you will be classified as a 'miner'. Anyone who acts like any of the heathens featured on this site. 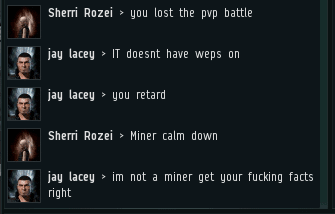 Cry about pvp in a pvp game and be labeled a 'miner'. And especially any "anti-ganker", if you try to interfere with any enforcement actions against a criminal miner, no matter how often you fail to stop the gank, then you also will be subject to such enforcement, miner. 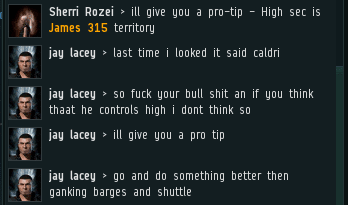 Aiding and abetting is a serious offence in modern day highsec. Civilizations need laws. 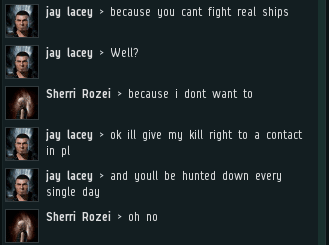 Anyone, no matter what the circumstances, who resides in highsec and refuses to buy and display a permit in their bio. You can't legally benefit from James' benevolence if you refuse to support and obey the Code. A heathen, a person who does not believe as you do? Wow that went south pdq. Did you see he was so mad he started adding extra letters as he mashed the keys so hard? "yourr" "bulllshit" "thaat"
Either that or he's role playing Max Headroom. either way, thaat's the voice I heear now. If it's RPing Max Headroom, it's making s poor job of it. Max Headroom had class and dignity. Jay, like other crayon eating carebears, lacks self respect. Also, is it just me, or did the content on this blog just go up again? Max Headroom. Haven't heard that name in decades. Was a gas. M-m-m-Max! M M M MMM-Max Headrrroom! The William Shatner interview is worth looking up. "Give it to education" I believe has some bearing on these posts. If we could educate the miners they would be better able to make the crucial decisions required to excel in EVE. Like if they should be playing an MMORPG PVP sandbox or maybe something softer. A lot of miners use excel spreadsheet to maximize their ore drawing potential to increase their hourly profit margins. its frustrating to lose the ship they paid lots of money for so they in turn use even cheaper parts to maximize profit while minimizing lose potential. Its a common business strategy in the economy. Time for that one butthurt carebear to fill the comments with his tears. I'll copy paste their words. I'll never pay James 1 isk!!! Can I borrow 10 million to buy a permit? "nazzies" made me laugh. I can just hear some old vet drawling that out. And that was just what was directed at my alt last month. Carebearz man! What a disease! I hope we can find a cure before EVE suffers too much to recover. And you just know that anonymous Abortion Guy is submitting comments madly hoping something will be approved. So you have classified PvE and non combatant players as carebears? Have you creared them as a race, Eg The reace of carebears? All humans belong to the same species, “race” is not a biological reality but a myth. If you keep using the word you place yourself squarely in the idiot camp. Too stupid to know the difference. Give up the genocide claims friend. If you can't play they game properly, don't get mad when you are lumped into the same group as others who fail, daily. I mean what is your argument? The only reason you have to ask about "races" is to try and prove a point that has no place in this game. Maybe you should leave the insular environment of your parent's basement and learn to be an adult. You sound just like the 'nazzies' you so love to cry about. Takes your 'racism' and gtfo. Go back to wow. Races are in fact a biological reality. Non-combatant player? Are you talking about a person who plays a PvP game and then refuses to engage in PvP? That's a carebear alright. Remember, Carebearism is determined by actions, not by nature, so it is always possible to reform. "Carebear is as carebear does." Religion can also be categorized by actions, correct? I totally agree with this. Dang I need to join Code. Just realized I've been fighting on the wrong side of this war. Why the wall of salt 445? Mad that someone has corrected your faulty opinion? Say nazi again, it really drives home just how sad, mad, and impotent you are. Ask any ganker, they can help correct your flaws. "Unfortunately its hard to comply to rules that are changing on a daily basis." Wrong shitteranon445, James set those rules waaaay back in what...2012, shortly after he was elected Ruler of Highsec. Did you not vote? 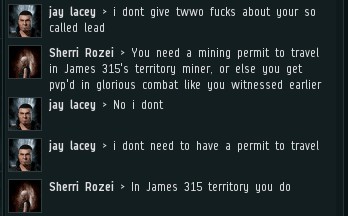 Too late to cry now, dry those salty tears and get your permit soon, miner. The only thing thag changes is the miner's interpretation of the Code. James has clarified some of the rules for the less educated miners, but otherwise Agents enforce the same Code they alway have. Does your head hurt after you copy/pasta so much ignorance? Thanks to the Code and the good people that enforce it, more miners are compliant and better educated than ever before. That doesn't mean the battle is over, there are still some die-hard criminals out there trying to subvert the will of the people, but the righteousness of the Code will bring you to heel eventually. Any rebellion based on criminal aspirations will fail, daily. Just ask the highsalt failitia, they know fail. Anon445's quotes don't even match the text. He's willfully ignorant, unconvincing, and lazy. People call code lazy, which side should be believed? Both hold the same arguments. woaaahhhh these rozei characters get abuse from an empty shuttle AND Empty pod. antigankers are failing hard. There's going to be more? Better grab my popcorn! Now that's some qualith posting friend. Content worth reading. "A governmental police force aimed at evicting from Highsec all them bums who fail to hail The Saviour James 315". It starts off strong and it made me lol. Time to evict some bums. Anon806 triggered, take that bait boi. Take it all the way down your throat. You know you like it, you keep coming back for more. boi is not proper English. Anti-ganking will never defeat the secret CODE. "covfefe" technique alluded to by President Trump, who was undoubtedly directly addressing James 315, congratulating him on the success of "Project: Covfefe" over the anti-ganking hordes. You are bringing RL into a game. You mean like calling CODE. Nazis? Would you rather they be called Space pussies? Sorry you lil ones needed to nerf your site again, cant take it I see. Puhleeese, what you mean is someone closed to door to the primate room again, that's all. Those ag monkeys like to throw their crap around and civized people don't want to be covered in it. Thanks James, the real content can be enjoyed now, without the ag diarrhea. 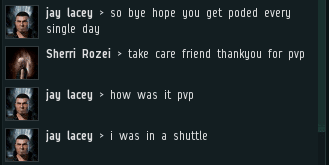 Like any Highsec Local, these hallowed comments should be kept clean. Simian poo-flinging belongs on reddit. Praise James 315! You have agents who comment who are not clean, they should get a lesson in commenting without cursing. Puhleeese is not proper English. This is boring. Wheres the troll? Code RP.The bullsheet is strong with this one my lord. Bullsheet is not proper English. Minerbumping.com has increased content by 85%! Minerbumping.com + higher standards = amazing! This is not actual math. All alpha ghetto leeches need a permit, and a subscription, before they are allowed to have an opinion. Capitalizing and separating every letter seems a wasteful use of space. That was quite unexpected but nice to see. When is the troll coming back?